Sometimes I wonder if there is a recipe god of coincidence. I’ve had some shrimp in the freezer for a while now and every recipe I plan to make with them just hadn’t happened. 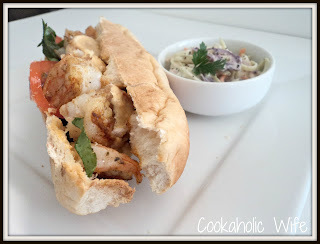 I went searching through my binders to find something and found a recipe for Shrimp Po’ Boys. Never having them before I figured I’d add them into the next week’s menu. Then I received my email for the Recipe Swap. The category is Too Hot To Cook and is all about recipes that don’t involve your oven. Its been can’t-breath humid around here and even though we have central air, we’re on the third floor so I do try to limit my oven usage as much as possible in the summer. So the coincidence part is that I was assigned Shrimp Po’ Boys. This isn’t the first time its happened so I’m sure it will again. I just find it awfully amusing. I wouldn’t think of Shrimp Po’ Boys as a recipe to make in a “too hot” challenge since most recipes call for them to be fried, but in this recipe you grill them. So you could even say this is the healthier version! Never one to pass up the chance to use my new Cuisinart Griddler, I made these right away. You may want to have bibs and napkins ready for this messy but awesomely delicious sandwich. This really was just incredible. I don’t even want to try one where the shrimp are fried. I served this with Old Bay oven roasted fries and some homemade coleslaw. I really don’t think there could have been a much better combination of tastiness on a plate. Lightening up the classic New Orleans sandwich, the shrimp are grilled instead of fried in this po’boy. Combine all of the ingredients for the remoulade sauce together in a small bowl and mix until fully combined. Cover and refrigerate until ready to use. Place the shrimp in a large bowl and add the olive oil and Cajun seasoning. Toss to coat. Place the shrimp on the grill and cook for 2-3 minutes per side or until the shrimp are opaque. Transfer to a plate and tent with foil to keep warm. Slice each roll in half and place cut side down on the grill until lightly toasted. Spread a generous heap of the remoulade sauce on both sides of the roll. Layer with lettuce and 2 tomato slices and a handful of shrimp. Repeat with remaining rolls. 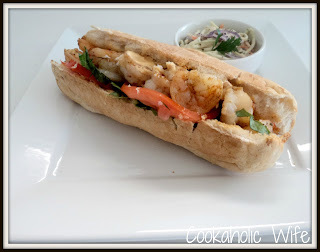 Shrimp on a sandwich? Very creative! Looks amazing!